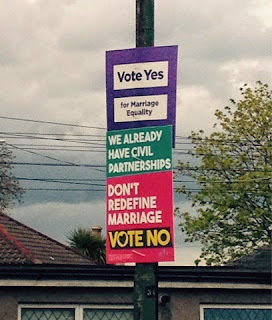 The big news in Ireland these days is a referendum on gay marriage coming up on Friday. Both sides are campaigning hard: with less than a week to go until the vote there may not be a single streetlight in Dublin without a referendum poster on it, if not two or three or six. While looking at the streets of Dublin might make you think Yes will take it in a cakewalk, No has stronger support in rural areas and some big heavyweights behind it, such as the Catholic Church. The Irish Government and all the major political parties have officially backed the Yes vote, though party membership seems divided on the issue and I don't see people voting against their conscience just to follow the party line. Recent polls show Yes ahead, but with a decreasing lead. I don't think anyone knows how this is going to go. But close races are more exciting, even for outsiders like myself with no stake in the outcome. EDIT 5/26: The ayes have it! The people have spoken, and gay marriage is now legal in Ireland.